‘Out of the Strong Came Something Sweet:’ A Practical Pastoral Luther? 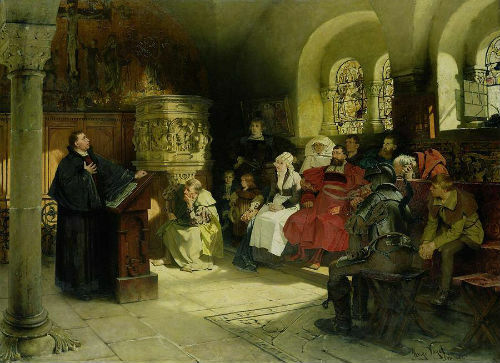 Many are the theologians and church historians who would agree with the observation that a psychiatric analysis might disqualify Martin Luther from teaching at a present-day seminary. For Master Martin was a turbulent tempestuous man, with an unsteady temperament, a word much in vogue today. One of Luther’s noteworthy phrases was what he called the “passive righteousness of God.” This God gives to us, we drink it in, like the ground absorbs the moisture from heaven, he taught. Salvation is therefore not something God owes us. Also, both Luther and his contemporary John Calvin were great communicators, Calvin with his French precision but Luther even more outstanding with his forceful folksy (sometimes crude) analogies and metaphors. He wrote and preached dynamically, a strength flowing from his colorful, multi-faceted personality. Inherent in Luther was not only this powerful articulation of saving grace but his almost unmatched ability to convey it in preaching and writing. His pulpit style cut through the din. Consider his folksy undercutting of the “cheap grace” argument. His imagination conjured up a forgiven sinner, yes, being covered with Christ’s robe of grace but—given that his feet are sticking out—the Devil is able to gnaw at them and cause the Christian much distraction. Here is empathy cleverly expressed wrapped in lively Gospel hope. Princeton psychologist James Loder referenced this very quote in a lecture given just days before his death. Yes, Luther could preach and he could write, and that was that. He portrayed hope in a pounding rhetorical style, utilizing above what English teachers call “Apostrophe” – the dramatic address to an inanimate object that is quite successful when used well. Luther had a flair for what pastors must do every weekend – enter into the mental terrain of his or her listeners. This means outflanking the cunning defenses of the heart, assessing the damage, showing the enormity of sin and yet compellingly expressing God’s offer of forgiveness. Luther’s ability to project himself into the sinner’s sense of loss struck at the conscience of Europe. That ability to draw the hearer into his confidence with candid, well-phrased confession – this was a trait that not all Luther’s fellow-Reformers possessed. Perhaps we miss the freshness of this approach after 500 years of analysis. How fortunate for the Reformation that its leading theologian had the common touch. Some of his rhetorical pronouncements can make us wince today but his “bringing it home” style was of untold advantage in winning the masses to the Reformation banner. What else might we expect in reporting on a theologian who, according to reports, felt it was better to be in the alehouse thinking of church than in church thinking of the alehouse. Martin Luther portrayed to the world a lively conquering hope that more than balanced his undoubted controversial traits. “They say best men are molded out of faults” Shakespeare says in “Measure for Measure.” Luther seems to be one of those.